Browsing through W.Palm beach antique shops,I came across this beautiful clock in a very shabby state, with inserts missing and/or in the process of coming off. Like most dealers,the seller was most amicable, with only one defect-he would not lower his asking price. 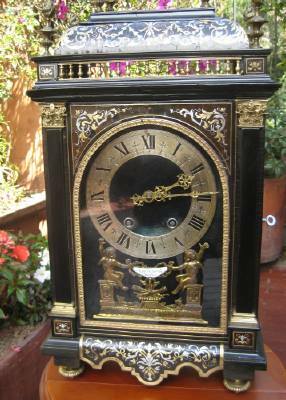 A month later, the clock was still available, with no change in price, so I decided to buy it there and then, without having done any homework beforehand other than seeing that there are no extra holes in the wood, and that the clock movement was not the original Martinot Paris one, as advertised by the enamel cartouche. Afterwards, I found out that both B & Gilles Martinot bought clock cases from Boulle,so at least the case is an original; also that Boulle worked only from 1680-90 with pewter and brass inserts,from then on only with brass. According to Mr. Harveson, my research should have been done before the purchase, but luckily it all worked out well in the end. My next lucky find was an antique restorer that brought the clock back to it's original glory. Thanks for sharing this beautiful clock. We all make purchases from the heart from time to time. Glad it worked out well for you.